At a press event in San Francisco, Google unveiled the latest updates to the Nexus device lineup. It’s coming in the form of two new phones: the 5.2-inch Nexus 5X, developed by LG, and the 5.7-inch Nexus 6P, developed by Huawei. Both devices pack the latest and greatest that these hardware manufacturers have to offer. They’re equipped with a 12.3-megapixel camera that shoots 4K video, run Android 6.0 Marshmallow, and pack fingerprint readers so you can quickly unlock your devices, or pay for purchases with Android Pay. Google announced during its Nexus event in San Francisco Tuesday that Android 6.0 Marshmallow will start to roll out starting next week, during the beginning of October. The update, which includes Android Pay, redesigned app permissions and Google Now on Tap, will be available for the Nexus 5, Nexus 6, Nexus 7, Nexus 9 and Nexus Player. It also comes installed on the Nexus 5X, Nexus 6P and forthcoming Google Pixel C tablet. Stay tuned for details on when Android 6.0 will arrive on other, non-Google branded phones, as manufacturers will announce those details separately. While going hands-on with the Nexus 5X and 6P a bit earlier, I noticed something interesting in the “about” screen of both devices: a new field. 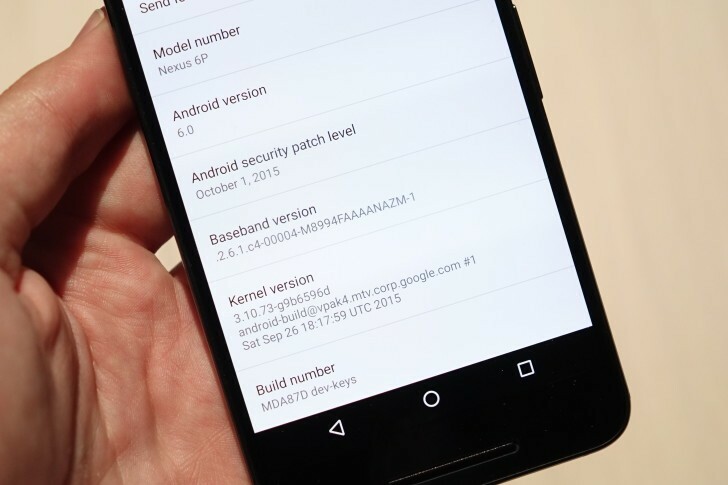 It’s called “Android security patch level,” and what it appears to do is display the date of your phone’s most recent security patch. We know Google has been taking significant flack for Android security updates post-stagefright, so it seems this feature may be in response to those criticisms. Google on Tuesday announced two new Nexus phones, as expected — the Nexus 5X and Nexus 6P — that will run the new, more capable Android 6.0 operating system, also known as Marshmallow. The phones will feature better cameras, bigger batteries, an improved fingerprint sensor on the rear of the case and power-saving features provided via Marshmallow software. One other important but little-known feature of the new OS should offer greater security to business users and IT managers, analysts said. At an event in San Francisco Tuesday, Google unveiled a number of new offerings that showcase both its capabilities as a software and hardware maker and its ability to capitalize on other companies’ wares. Along with two new Nexus phones running an updated version of Google’s Android mobile operating system, CEO Sundar Pichai and his team showed off a new iteration of Chromecast, which streams content from computers or smartphones to television sets, and the Pixel C, a large tablet with a full keyboard, the first made entirely by Google. BlackBerry on Tuesday revealed the first photos of its security-focused Android smartphone, the Priv. In a blog post, the Waterloo, Ontario, smartphone maker released photos of the Priv, which is expected to launch in the fourth quarter. Priv stands for both “privacy and privilege,” according to BlackBerry CEO John Chen, and it’s the company’s first product to run on Google’s Android mobile software. The device underscores a radical departure from BlackBerry’s history of selling products using its own homegrown software. SAN FRANCISCO — That dream for a touchscreen Mac running iOS may never come true. Apple CEO Tim Cook on Tuesday dismissed the assumption that Apple will merge its iOS mobile software with its OS X computer software — which means iPads and Macs are going to stay separate products even with all the new similarities between them. “We don’t believe in having one operating system for PC and mobile,” Cook said Tuesday during a fireside chat with Aaron Levie, CEO of Box, a company that provides cloud storage for businesses. Now that Apple is blurring the lines between its mobile tablets and PCs with the iPad Pro, it’s tempting to imagine iOS and OS X merging into a single operating system (Windows 10-style) that works on virtually every device the company makes. You’ll want to put any such ideas on hold, though. In a chat with Box’s Aaron Levie, Apple chief Tim Cook dismissed the prospects of unifying iOS and OS X. It “subtracts from both,” he said, arguing that you “don’t get the best experience from either.